What if your daughter spotted you in a rock video perched on the shoulders of the father she never met? “Robin Hamilton, New York attorney, is poised to reveal a three-decades-old family secret that will at once alter the course of three lives. One winter evening, Robin and her adult daughter Lark are watching a television documentary when Lark unexpectedly spots her mother in a rock concert crowd, twenty-one, luminous, and perched on the shoulders of a handsome young man. That man is Lark’s father, Dean Falconer, though neither of them knows the truth. Robin decides it’s time to come clean. Flashback to 1977. Robin Hamilton meets Dean Falconer at a concert in Washington, D.C. The two fall in love over the course of a single transcendent weekend. But now Robin hasn’t spoken to Dean in thirty-five years. While Lark is enthusiastic about meeting her father, Robin must deal with what could have been after three decades of loneliness and broken dreams. A spring full of revelations, and one extraordinary summer in the foothills of the Blue Ridge Mountains of Virginia will teach these three people the ultimate measure of honesty, passion and devotion. 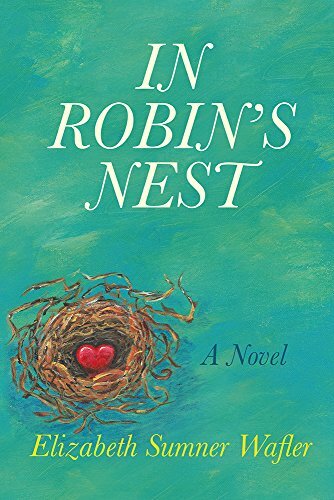 In Robin’s Nest by Elizabeth Sumner Wafler is an amazing read. Readers will instantly be dragged into a family’s deepest secrets and must live courageously to face what lies ahead. The truth needed to be released. After many years, a mother has decided to let it out of the bag. Memories from the characters’ past swept me off my feet and into a whirlwind of love, honesty, and fate. Image a father having never known he had a daughter and a daughter never knowing her father…this is one secret that will haunt and terrify a mother who tried to what was best. The future holds a lot of hope, love, and new beginnings. I enjoyed following the characters as they grew as a family. A family that finally found everything they ever wanted. Beautifully written, inspiring, and realistic. A mother, a father, and their daughter all experience a journey. One that will stun readers with joy and above all hope. This was the first novel I have read by Elizabeth Sumner Wafler. I highly recommend it to all.